In 1991, 697,000 U.S. soldiers, along with coalition forces from nearly 40 countries, deployed to Saudi Arabia for Operation Desert Storm, determined to remove Saddam Hussein’s invading Iraqi army from the oil-rich nation of Kuwait. 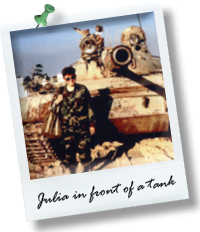 Nearly 50,000 U.S. female soldiers deployed to the desert battleground of the Persian Gulf War. Although technically serving as “combat support,” these women soon found there was no rear line in the Gulf to protect them from combat situations. They loaded their M-16 rifles, drove ammunition trucks into Iraq, served as MPs and set up war-zone field hospitals, vowing not to return home to their children in body bags. Operation Desert Storm was toxic battlefield. Female soldiers came under fire in a hot, dusty world of oil well blazes and Scud missile attacks. They experienced exposures to bio-chemical weapons, oil well fires, anthrax inoculations and depleted uranium that sent many of them into casualty hospitals. Today these women, disabled, some confined to wheelchairs, struggle to care for their families and search for answers to their debilitating illnesses. Nearly half of the soldiers who fought in the Gulf War are now sick and dying. Their voices cry out for help: Why has our government denied us proper testing, treatment and compensation? Why have we been abandoned by the country we laid down our lives to serve?